Place olive oil in a large soup pot set over medium heat. Add sweet potatoes, onions, corn, carrots, poblano peppers and garlic to the pot. Reduce heat to low and cook for about 10 minutes until the vegetables are browned making sure not to burn the vegetables. Add the water to the pot, bring to a simmer and simmer for 10 minutes. Add coconut milk, spices and cilantro to the pot. Simmer soup for another 20 minutes on low heat. Add the salt and simmer the soup for 15 more minutes. Remove soup from the heat and cool. 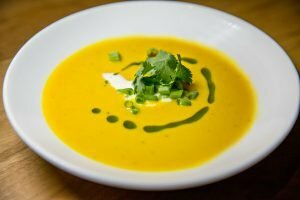 When soup has cooled, puree it using an immersion blender, blender or food processor. Add more water as needed if soup is too thick. Ladle the soup into bowls and garnish with cilantro, green onion, and crème fraiche.